This cheesecake is based from the one that you can purchase from Sam’s Wholesale Club. You will find the nut crust quite unusual. You can make a cheesecake that tastes like the Cheesecake factory cheesecake. Mix all nuts and vanilla wafer crumbs with melted butter and press in the buttered springform pan, trying to line the sides as much as possible about 1 1/2" up the sides of the pan, set aside. Pour cream cheese into the springform pan. Place on the top rack in the middle of a 325 degrees preheated oven for one hour and 15 minutes. When time is up, prop open oven door and leave in oven for one hour. After one hour, remove from oven. 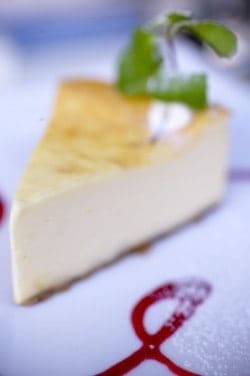 Let cool enough before the cheesecake is put into the refrigerator for 24 hours. A cheesecake should season. The wait is worth it. The flavor ripens and becomes enriched. Fantastic recipe! Thanks Stephanie☺. Made it without the crust and baked it as directed, but in a water bath. No cracks! It’s in the fridge now chilling overnight. Can’t wait to top with berry compote then devour! I made this cheesecake recipe after seeing it online a week ago. The cheesecake itself is good, but there is a flavor in the crust that I do not like and I cannot pinpoint it. I followed the recipe as written as far as ingredients go, but I put my spring form pan in a water bath and left it in the oven after turning it off for more than one hour to prevent cracking. There were no cracks and the appearance was flawless. I have eaten one piece each day since I made it and gave some away. The taste does improve with time. I think I will do a different crust (maybe just delete the vanilla wafers) next time I make it. They contain artificial flavoring and maybe that is it. It is worth saving and making again instead of moving on to a different recipe. Do you turn the oven off or leave it on after the 1 hour and 15 minutes? chocolate hobnobs are amazing for the base of this cheesecake!! love the recipe. I’ve made it about 6 times and every time I used a something different for the crust. The fav so far is graham cracker, nilla wafers and pecans. Best. Cheesecake. Ever. My first cheesecake using this recipe was too dry, so I have reduced the cooking time by 15 min. to only 1 hour, and WOW! This cheesecake is awesome, and my family and friends will attest to that! You can use a traditional graham cracker crust and it is still the best.